Performance run time is 3 hours, including one 15-minute intermission. 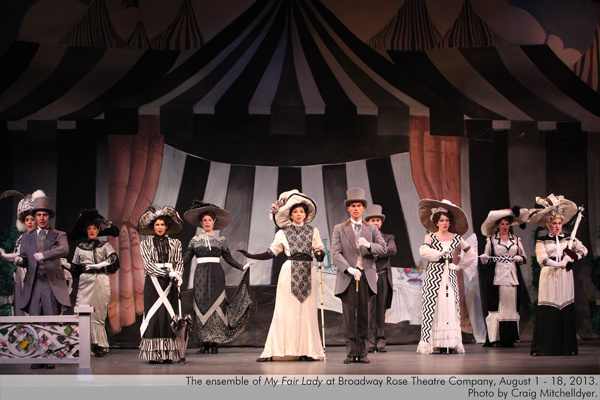 My Fair Lady is a musical based upon George Bernard Shaw’s Pygmalion; every song in Frederick Loewe’s score is wonderful and Alan Jay Lerner’s book and lyrics are clever and deeply felt. In 1956 the musical was a hit and ran on Broadway for 2,717 performances setting the record for the longest run of a major Broadway musical. 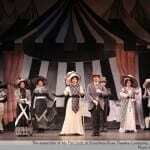 The original production was underwritten by CBS for $400,000. Our production might cost about half that. Today it is very difficult and costly to produce these huge musicals professionally; in fact, it costs about 11 million to produce a major musical on Broadway! But I love musicals with large ensembles full of glorious voices and solid performers creating the magic. 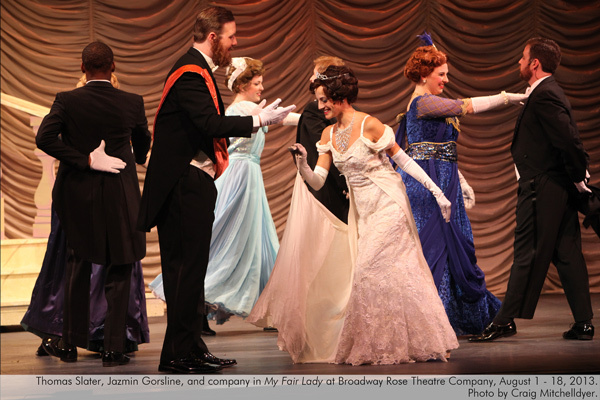 Broadway Rose is fortunate to be able to produce classic musicals with large casts, sets, costumes and musicians. And I am thrilled that young and old alike get the opportunity to see these gems as they were originally produced. Our audiences share in this passion for the classics. 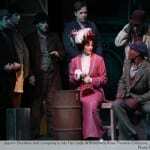 I myself have fond memories of performing in My Fair Lady as a sophomore in high school. I was cast in the ensemble, and had only one word to say in the whole production. But I had a great entrance and a fantastic costume. I worked on my line delivery every day. My big moment came when, as the Queen (with a great crown), I royally descended the stairs at the ball, was struck with Eliza’s beauty, turned, and said “charming, charming” to Eliza at the ball. 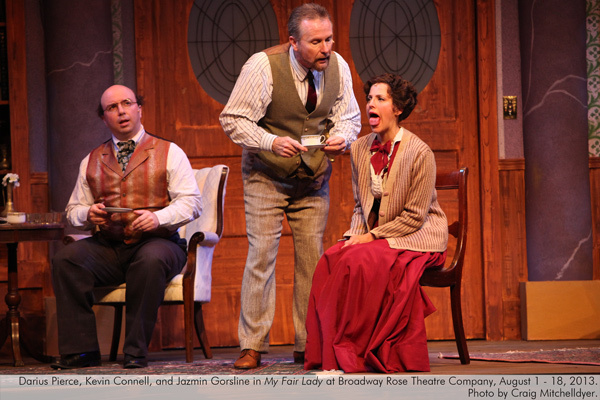 Kevin Connell (Henry Higgins) returns to Broadway Rose after appearing in the first production of Lucky Stiff with a strong background in classical and contemporary theater. Kevin is a company member of the Northwest Classical Theater where his portrayals have included Antony in Antony and Cleopatra, the Duke in Measure for Measure, Cassius in Julius Caesar, and Petruchio in The Taming of the Shrew. Kevin performed for five seasons at the Idaho Shakespeare Festival in such roles as Richard II, Don Pedro in Much Ado About Nothing, the Masked Man in Spring Awakening and the Player in Rosencrantz and Guildenstern are Dead. Kevin portrayed Macbeth and Don John in Much Ado About Nothing (1999 Drammy) for Tygers Heart, Prometheus in Prometheus Bound and Jason in Medea for Classical Greek Theater of Oregon, Leontes in The Winter’s Tale for Lord Leebrick Theater of Eugene, and Cyrano de Bergerac at Harvard University. Kevin’s contemporary roles include Salieri in Amadeus, King Arthur in Camelot, Nicky Arnstein in Funny Girl, Marat in Marat-Sade, The Mikado, Tuck in Tuck Everlasting, Van Helsing in Dracula, Max in Bent, Elyot in Private Lives, Stuart in Beyond Therapy, Midas and Hades in Metamorphoses, and Judge Turpin in Sweeney Todd (2001 Drammy). Kevin directed numerous productions at Gonzaga University including Romeo & Juliet, Curse of the Starving Class, Take Me Out, The Three Musketeers, The Last Days of Judas Iscariot, Moliere’s Don Juan, and his own adaptation of Aristophanes’ Lysistrata. Kevin (who is a Jesuit and has worked at Jesuit High School and St. Andrew Nativity School) also appeared in the films The Family Holiday and Knights of Badassdom. Darius Pierce (Col. Pickering) is very ‘appy to be back at Broadway Rose after playing Thenardier in Les Misérables (PAMTA for Supporting Actor). Previous credits include Beard of Avon (Drammy Award for Outstanding Lead Actor), Twelfth Night, 25th Annual Putnam County Spelling Bee, The 39 Steps, Frost/Nixon, How to Disappear Completely and Never Be Found, Misalliance, A Christmas Carol, A Christmas Story, Santaland Diaries, and the JAW Festival (PCS); The Gaming Table and Comedy of Errors (Folger Theater); Lips Together, Teeth Apart (Profile Theatre); As You Like It (Portland Shakespeare Project); Bloody Bloody Andrew Jackson (Portland Playhouse); The Long Christmas Ride Home and A Devil Inside (Theatre Vertigo). He is also a co-founder of the Anonymous Theatre Company. Blake Cranston (Freddy) has been performing since he was nine years old and has played roles including Marius in Les Misérables and Tobias from Sweeney Todd: The Demon Barber of Fleet Street. 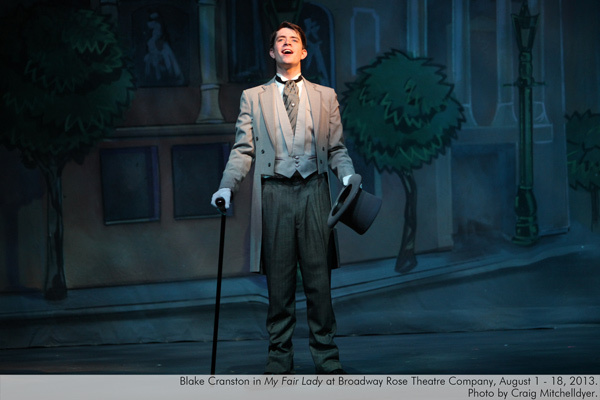 Blake currently attends Central Washington University where he is studying Musical Theater. He feels truly blessed to be able to share his passion with you on the Broadway Rose Stage and hopes that you will enjoy the show! 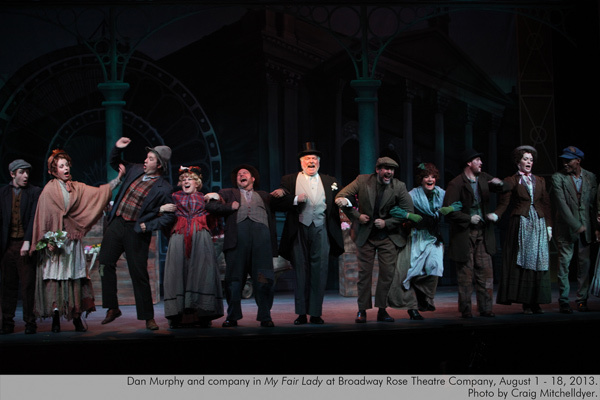 Dan Murphy (Alfred P. Doolittle) is the founding General Manager of Broadway Rose Theatre Company. He has appeared in many of the company’s shows over the past 22 seasons, most recently as Man in Chair in The Drowsy Chaperone and as Edna Turnblad in Hairspray (Drammy, PAMTA). Dan has performed locally with Lakewood Theatre, Pixie Dust Productions, Oregon Children’s Theater, The Musical Theatre Company, and Magdelyn Theater. 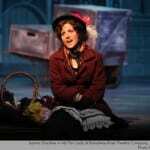 Paige Jones (Mrs. Pearce) has been seen before on the Broadway Rose stage in Rumpelstiltskin; other favorite Portland productions include: Mother Courage in Mother Courage and Her Children (Theatre Vertigo), Richard in Richard II (Northwest Classical Theatre Company), Mrs. Pludek in The Garden Party (defunct theatre), M.J. in Inspecting Carol (Artists Repertory Theatre), Lotte in Fools (Profile Theatre), Camilla in Rapture (Stumptown Stages), and Susie in Omnium Gatherum (WillieWorks). Shannon Jones (Mrs. Eynesford-Hill) received a Master of Music degree from The Boston Conservatory and a Bachelor of Arts in Music degree from Bennington College. 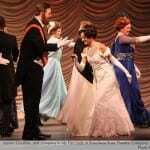 Additional training includes a residency in Graz, Austria, as part of the AIMS Voices of Summer festival, and in Eureka Springs, Arkansas, as a company member of Opera in the Ozarks. Locally, Ms. Jones has performed with Bus Stop Opera, Opera Theater Oregon, Wilsonville Theater, Willamette Concert Opera, Northwest Children’s Theater, and the Bel Canto Northwest Summer Vocal Institute. Her last two shows, with Coho Productions and with 45th Parallel, were premieres of contemporary works by Portland composers. Ms. Jones lives in Portland and studies with Nancy Olson-Chatalas. Thomas Slater (Zoltan Karpathy) This is Thomas’s second show with Broadway Rose and he is excited to be back! He was also Underling in last summer’s production of The Drowsy Chaperone. Other shows include City of Angels at Lakewood Theatre, and the CoHo Theatre’s production of To Kill a Mockingbird. Dream roles include Jean Valjean in Les Misérables and the Lecturer in Reefer Madness! : The Musical. Thomas would like to give a special thanks to his wonderful fianceé, Laura, whom he’ll be marrying in September. Never was there a luckier man in all the world! Jim Peerenboom (Harry) was raised in Salem, OR, where he was active in community theater since childhood. Currently, he is the theater director at Lincoln High School in downtown Portland where he has directed such productions as The Sound of Music, The Prime of Miss Jean Brodie, The Ramayana, The Laramie Project, and many other plays starting with “The.” As a performer, Jim has been seen in productions with Lakewood Theatre Company, New House Productions, Western Oregon University, and the Portland Gay Men’s Chorus. 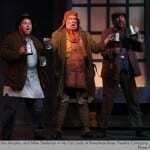 Jim is also the theater methods instructor for Portland State University’s GTEP program. He studied Theater and English for Secondary Education at Western Oregon University from which he earned a Master of Arts in Teaching. Jim would like to thank his family and friends for their support, and Broadway Rose for the opportunity to work with such incredibly talented people. Mike Dederian (Jamie) New to Broadway Rose, Mike recently appeared at Lakewood Theatre Company as Emile in South Pacific. He also appeared there in Curtains (Oscar); in Goldilocks (Max) and The Baker’s Wife (M. le Marquis) with Lakewood’s Lost Treasures Collection; and with Portland Actors Ensemble in The Tempest (Prospero) and Henry IV (Douglas). An internationally produced playwright and graduate of Harvey Mudd College, Mike hails from the San Francisco Bay Area, where his favorite roles included The Actor (Enter the Guardsman), Robin Oakapple (Ruddygore), Dexter (High Society), Zach (A Chorus Line), and Tateh (Ragtime), for which he won the regional Shellie Award. 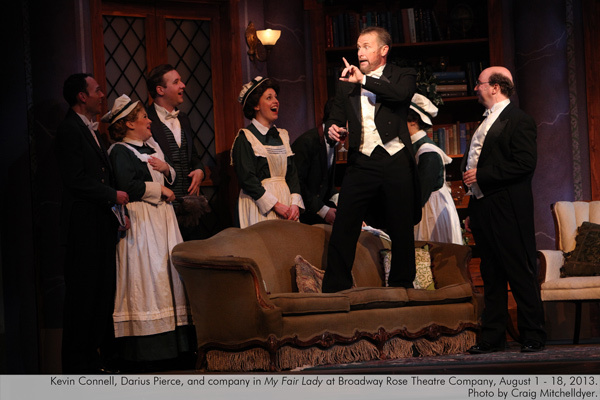 “Hear them down in Soho square, dropping H’s everywhere.” So sings a disgruntled Henry Higgins in “My Fair Lady,” currently presented by the Broadway Rose Theatre. To full houses, I might add…Read more. Director Sharon Maroney delivers both humor and big-scale dance numbers (like the enthusiastic “Get Me to the Church on Time”) to the stage with ease…Read more. Because it is a long, complex endeavor that demands an exacting blend of singing, dancing, acting (oh, those English accents!) and multiple elaborate sets, the show is not performed as often as it deserves to be. 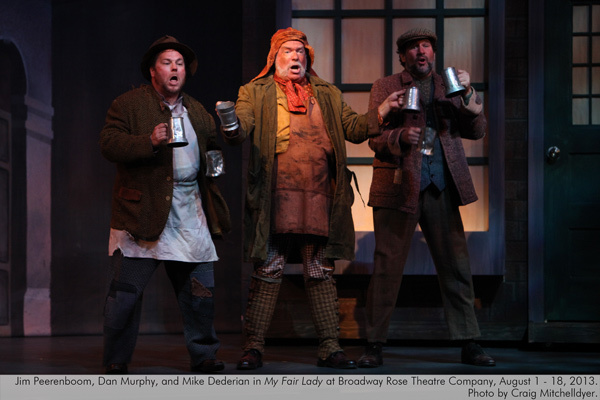 It’s bloomin’ loverly that Broadway Rose has the financial backing, theater, talent base, organizational structure, orchestra and community support to pull it off with such aplomb…Read more. 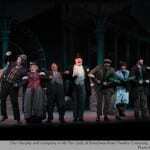 Of course I knew the music; anyone who’s been anywhere near a musical has to know the score of My Fair Lady. What I hadn’t realized is how much fun the show is…It’s utterly charming and you won’t stop smiling from beginning to end…Read more. There’s no better taste of the show’s magic than with the new production by the Broadway Rose Theatre Company that opened over the weekend at Tigard’s Deb Fennell Auditorium. With beautiful singing, sharp acting and plenty of tight choreography, it’s a showcase of everything that’s made this one of the greatest musicals ever…Read more. 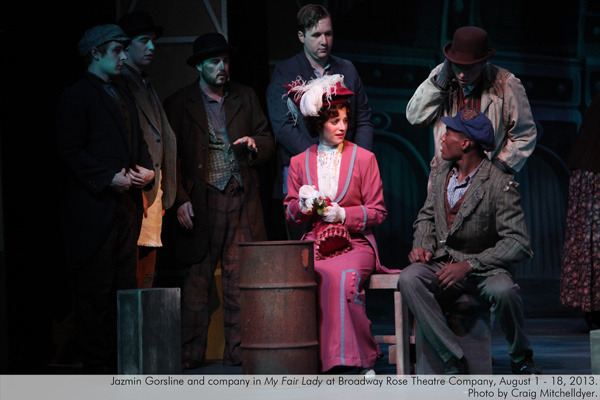 Actress Jazmin Gorsline may get a feeling of déjà vu when she returns to the area and dons the Cockney accent of Eliza Doolittle in “My Fair Lady” in the next few weeks…Read more. 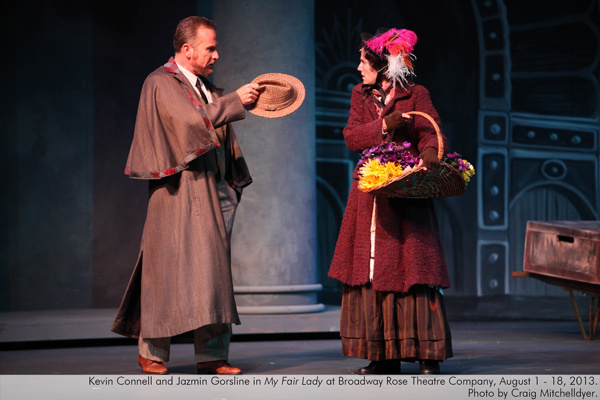 It’s been more than 50 years since the classic musical “My Fair Lady” premiered, but with all the attention the show has received lately, you’d think it was as fresh as a Broadway ingénue. 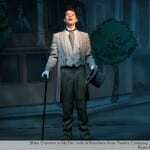 This year, the musical gets two big Oregon productions. On Friday, Tigard’s Broadway Rose Theatre Company unveils its lavish, traditional staging, which runs through Aug. 18…Read more. 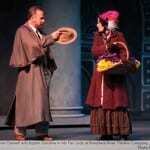 The classic musical “My Fair Lady” is getting two lavish productions in Oregon this year. 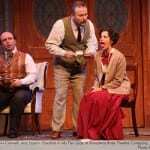 Broadway Rose Theatre Company unveils its traditional interpretation of the show on Friday, while the Oregon Shakespeare Festival continues its stripped-down version of the show through November. Before seeing either production, check out these fascinating facts about the show and its lasting-impact on American musical theater…Read more. 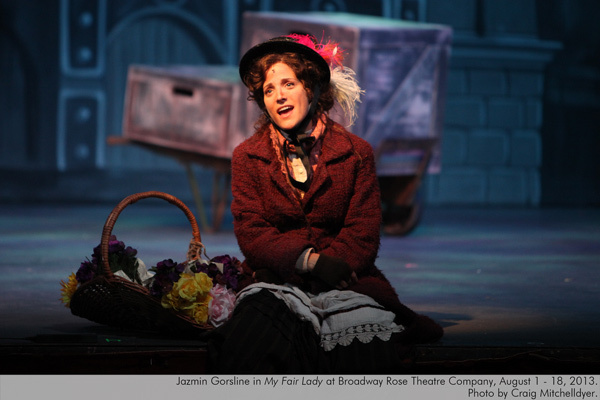 When Jazmin Gorsline steps onto the stage as Eliza Doolittle in the Broadway Rose Theatre Company production of My Fair Lady this summer, there will be lots of familiar faces in the audience if she could only see them in the darkness…Read more.